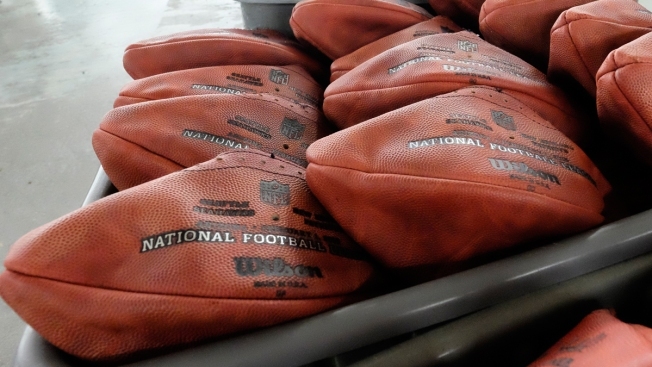 Official game balls for NFL football's Super Bowl XLIX sit in a bin before being laced and inflated at the Wilson Sporting Goods Co. in Ada, Ohio, Tuesday, Jan. 20, 2015. A series of emails between employees of the Patriots organization and the NFL denounce leaks in the league. The emails, released Friday by the team, were sent Feb. 17-19, including one sent from Patriots Media Relations Vice President Stacey James to NFL spokesperson Greg Aiello. Kraft Group Vice President and Patriots general counsel Robyn Glaser forwarded that message to and opened an exchange with NFL Executive Vice President Jeff Pash. The messages blast an ESPN story citing "four sources close to the investigation," which James and Glaser say could not have come from the team. Both Patriots employees allege that the ESPN caused serious damage to the team's reputation. "This ESPN piece ... is yet the latest in League leaks (because the only others "familiar" with this investigation are us, and we can assure you we are not talking to ESPN or anyone else)," Glasser wrote in an email to Pash. "And once again, the information is not only inaccurate, but completely inflammatory and profoundly damaging to our brand." Pash denied having any reason to believe the leaks came from the league. "Thank you for the prompt response," Glasser replied. "But these leaks would only come from the League office as it would not serve anyone else's purposes. We strongly urge you to publicly correct all of the facts ASAP, and to bring your staff and office under control." "What is unconscionablle to me is that the league holds data that could very well exonerate us from any wrongdoing and completely dismiss the rampant reports and allegations of nefarious action, but the league refuses to provide the data. I cannot comprehend how withholding the range of PSIs measured in the game is beneficial to the NFL or the Patriot. I can only assume, based on the scientific evidence that has been provided to us by multiple independent scientists that the PSI numbers will be within the scientific range. If we had been provided this data within days of the original report, we could have changed the narrative of this story before it all led all national news and the damage was done," James initially wrote to Aiello. "It has been over 4 weeks and we still can't get a simple detail that I assume was available the night of the AFC Championship Game!" Comcast SportsNet New England's Tom E. Curran has more analysis here.